It is not Sachin Tendulkar's fault that his world record-equalling 34th Test century came against lowly Bangladesh. Despite this, many former cricketers and media-men are throwing disguised barbs in the form of comments and `expert' pieces, rather than lauding the `Don' of a new era. One of them came up with an ingenious attack: Granting of Test status to Bangladesh has resulted in hallowed Test records coming under threat! This decidedly below-the-belt slug came a day after Tendulkar made the ton that brought him abreast of the record of another legend of Indian batting, Sunil Gavaskar. 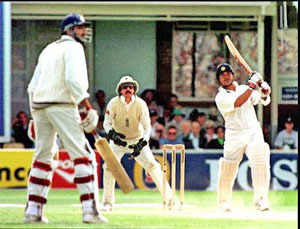 The heinous attack ensured that rather than being hailed during his finest hour, Tendulkar was actually being belittled by short-sighted critics. Of course it is nobody's argument that Bangladesh are a force in international cricket. But runs scored against them, or their wickets scalped are as much a part of cricket records as any. Tendulkar certainly did not go out seeking a limp attack to notch his 34th Test ton. Nor are all his 34 tons against such attacks. For that matter, not all of Gavaskar's 34 centuries were top-drawer ones. I distinctly remember his 1983 century against Pakistan in Bangalore. The Pakistani attack was the worst in living memory: Tahir Naqqash, Azeem Hafeez, Mohammed Nazir, Iqbal Qasim and Mudassar Nazar! The Bangalore pitch was excessively placid and the match was heading for a certain draw. With Gavaskar a few runs short of his century, Pakistan skipper Zaheer Abbas took his team off the field at the completion of the 14th mandatory over. But Gavaskar would not come off. He wanted his hundred, even if it meant flogging a dead attack. It made for a hilarious sight before umpires Swaroop Kishen and M.V. Gothoskar used all their powers of persuasion to get the Pakistanis back on the field for Gavaskar's hundred. All trooped off the ground shortly after the milestone was reached. Gavaskar knew a Test hundred was something to cherish and was loathe to let one slip away simply because the Test was meandering into a dull draw. It was not his problem that Pakistan came with a pathetic bowling attack. He was in the business of scoring runs and willing to take tons off anybody. Even earlier, in 1978-79, the West Indies sent one of their weakest ever teams -yes, weaker than even the current one. They had two rookies, Norbert Philip and Sylvester Clarke as fast bowlers, an ageing Vanburn Holder as support and a teenaged greenhorn Malcolm Marshall in tow to learn the trade. Gavaskar accumulated four centuries against this attack (205, 107, 182 n.o., 120). He added two more against the other Kerry Packer-ravaged team, Kim Hughes' Australians (115, 123) that season. Earlier, the Australians, without their Packer stars fielded a poor eleven captained by an ageing Bobby Simpson who was brought out of retirement after all the main players, barring Jeff Thomson, ditched the national team to turn out for Packer. Gavaskar lapped up three more centuries in the Tests Down Under against that near-lame duck attack to leave everybody in no doubt that he would grab every opportunity to notch up tons. Of course Gavaskar also made centuries in the most trying circumstances against the best of world attacks. The unbeaten 127 against Pakistan-led Imran Khan in Faisalabad was outstanding. As were his tons against the four-pronged West Indies pace attack. Gavaskar's finest riposte was at The Oval in 1979 after Fred Trueman, the former England paceman had described the Indian cricket team as a ``rag tag bobtail outfit masquerading as a Test team.'' The right-handed opener slammed an epic double hundred that brought India within a couple of strokes of one of the greatest Test wins in the history of the game. Gavaskar's batsmanship shut Trueman up once and for all. By the time Gavaskar laid down his combative willow that had taken tons off the best and worst attacks in the game, he was hailed as one of cricket's all-time greats. His fellow Mumbaikar Tendulkar, even if he is three to four years from retirement, is already ranked among the legends of the game. Thus the attempts of former players and critics to belittle his record-equalling century do not do justice to the many amazing innings he has played in these last 15 years. Who can ever forget those blazing knocks that made mincemeat of Shane Warne in India and Sharjah? Or the blistering centuries in South Africa and Australia in the 1990s? Of course Tendulkar has made a few soft centuries. But then which of the world's great batsmen has not helped themselves to such tons? Viv Richards, Gavaskar, Greg Chappell, Brian Lara, or even the Don himself, have all benefited from occasional weak attacks. So why grudge Tendulkar his `easy' tons. Millions of cricket fans know that he has carried Indian batting on his shoulders for over a decade. Instead of taking potshots at this great sportsman and entertainer, let us all bask in his record-breaking efforts and soak in the hours of pleasure that his exploits has brought us. After all, no batsman in the history of the game has made as emphatic an impression in both forms of the game as Sachin Tendulkar. Way to go Sachin!